Wrap the cod in foil. It stays moist and keeps its flavour. An all in one dish. Peel the sweet potato and cut in thick rounds. De-seed the pepper and cut in large pieces. Pour oil in a baking tray . Add the vegetables and stir to coat. In the meantime place the cod fillets on a sheet of foil. Add butter under and over the fish. Add the mushrooms and the bay leaf. Bring together the edges of the foil to make a parcel. 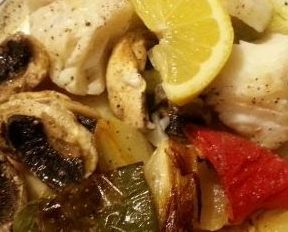 When the 10 minutes are up, stir the vegetables, place the fish parcel on the tray with the vegetables. Return to the oven for 23 - 25 minutes or until the fish flakes when pressed. 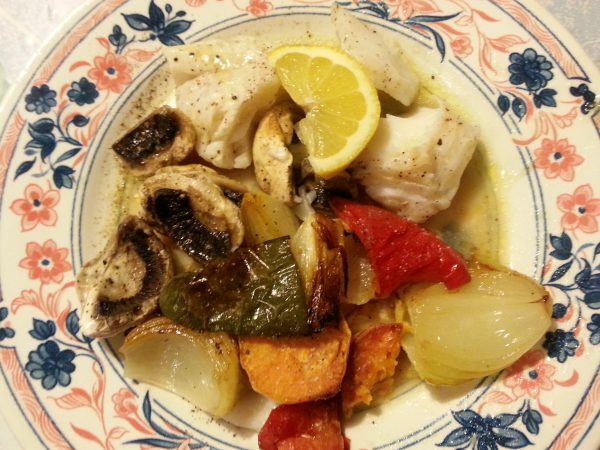 Transfer the fish and the cooking juices out of the parcel onto two plates and serve spooning the vegetables around.